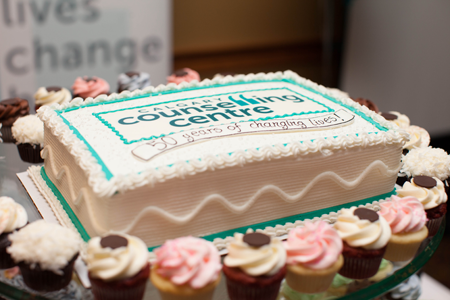 For the past 50 years, Calgary Counselling Centre has been a force in our community and we were evidently reminded of that at our 50th anniversary celebration that took place on October 23, 2013. The night reaffirmed that the work we do at the Centre plays an integral role in the lives of many in our community. The event was held at Ranchmen’s Club and consisted of networking, video vignettes, speeches, cocktails and appetizers. We were thrilled to hear from Mayor Nenshi, Brett Wilson, Lois Haskayne, Associate Minister Sandra Jansen, Minister Manmeet Bhullar, Jackie Sieppert, Cathy Keough and Nancy Laird. The celebration was concluded with a speech from Calgary Counselling Centre’s CEO, Robbie Babins-Wagner, that captured the essence of what the Centre stands for and celebrated many milestones along the way. The celebration was a huge success; housing a diverse group of people sharing inspirational words about the work we do at the Centre. The energy and enthusiasm radiated throughout the night and the level of participation from the public speaks directly to the work we do at the Centre and the role we play in the Calgary community. When we look back at our 50 years of work in our community, we can’t help but feel proud. We’re proud of our accomplishments: the groundbreaking research that has led to revolutionary and highly successful counselling programs; the vast collaborations we have with many different community partners; but most of all we are proud of the reason we are here: our clients and the work they’ve done changing and reshaping their lives. They are our inspiration and their needs are what drive us. It has been an honour to serve our community for 50 years, and we can’t wait to serve it for 50 more.